This historic home features a large, fully equipped kitchen with breakfast nook and banquette seating. The kitchen is open to the large living/dining room and this spacious layout provides opportunities for family interactions and a perfect environment for entertaining. The master bedroom has a queen size bed and an attached master bathroom. An adorable additional bedroom is furnished with two twin beds. The sleeping den features another twin bed. An airbed provides the option for an additional guest. The downstairs of the home features a second full bath, washer and dryer and storage area. The bright airy living room has comfortable seating and amazing views of Liberty Bay as well as a tv with cable and dvd’s. The large front and back yards present many opportunities for entertaining, playing, relaxing and enjoying the view of the mountains and Liberty Bay. 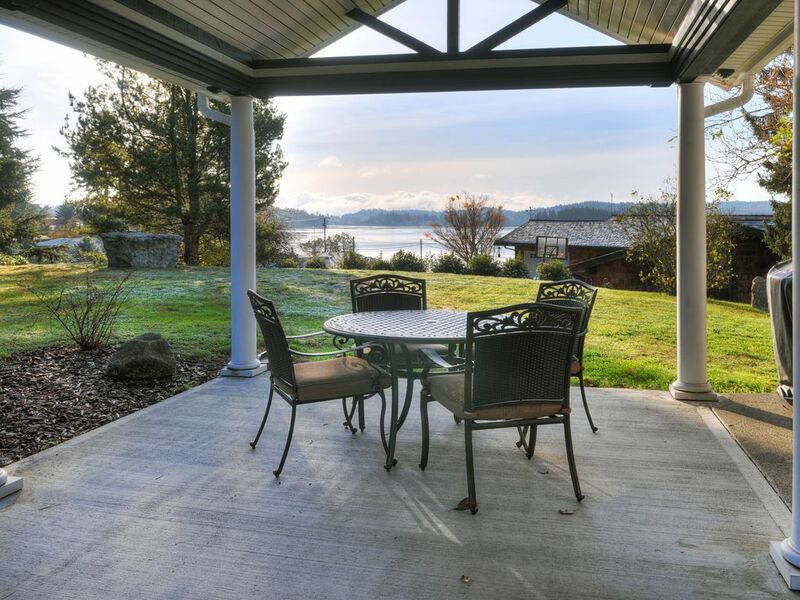 This tremendous location is across from the Yacht Club and Poulsbo Marina. Lions Park with its playground and tennis courts is a 4 minute walk from the house. It is an 8 minute walk to Historic downtown Poulsbo featuring restaurants, art galleries, shops, entertainment, attractions and Scandinavian charm. Canoe/Kayak rentals are available at the Poulsbo waterfront marina. Check out another one of our homes, property # 512663 about 15 minutes from Poulsbo. What a beautiful view from this home! And the home was very well equipped for our stay. Kitchen fully stocked with dishes, glasses, cups, everything we needed. Lots of space for five high school friends to gather and visit and play games, etc. Nice walk into town. We really enjoyed our stay!! I really enjoyed our brief stay at this property. Property was clean and well kept. I liked that is was a quick walk to the downtown area where there seemed to be plenty of entertainment options. The view from the big picture window was very nice. We spent a fantastic week and a half in this darling home and hope to return many more times in the future. The view of the bay and mountains behind is breathtaking. The house was immaculate, quiet and comfortable with all of the amenities needed to move in and set up housekeeping. Also provided was lots of great lit about things to do and see in the area. This place is a treasure! My family and I absolutely loved this property. Great location with fantastic views. Well-equipped spacious kitchen, albeit I personally would prefer better lighting. Built in 1905, this place is a gem. We loved the mix of mostly new with a dash of 1905 here and there in this charming Poulsbo property. Sabine is very easy to work with and promptly responds to all correspondence. The only reason for the four star review vice five is the location of the 2nd bathroom. As mentioned in other reviews, it's down a steep narrow flight of stairs that you have to access via a bedroom. You should consider this if you have any small children or elderly in your party. Best part - close to Sluys' Bakery!!! I stayed here with my 2 grown sons and nephew and it was perfect for us. The kitchen and appliances were a big plus, and the living area had really comfortable couches and great view. As a cozy family that likes to eat and be together, this worked great. Charming historic home with a great view! Stroll down Front Street as it winds its way through the heart of town along Liberty Bay. Discover a wide varity of shops that offer everything from fine art, antiques, apparel, gift shops and specialities. Find everything from espresso stops, cafe's to fine dining in cozy places for families and friends to gather. Enjoy the view from a beach at delightful Waterfront Park or follow the unique boardwalk along the shore. Look for seals, herons, migratory birds and raptors. During the month of April - December check out our Farmers Market . Relax and give yourself plenty of time for a day full of fun and food for the whole family in Washington's ' Little Norway ' on the fjord. Rates are subject to change without notice. Holiday weeks the high season rate will apply. Reservations in high season of 4 or less nights, the higher rate will apply.